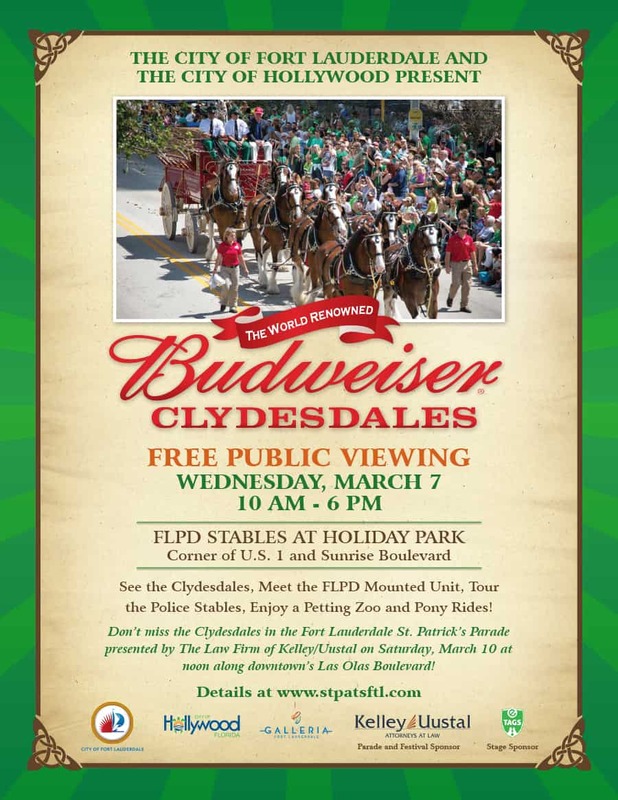 The City of Fort Lauderdale and the City of Hollywood will host a free public viewing of the world famous Budweiser Clydesdales on Wednesday, March 7 from 10:00 a.m. to 6:00 p.m. at the Fort Lauderdale Police Mounted Unit stables, located in Holiday Park at 700 N.E. 9 Street (corner of U.S. 1 and Sunrise Blvd.). In addition to viewing the Clydesdales, the free event will feature tours of the Fort Lauderdale Police Mounted Unit stables, a petting zoo, and pony rides. Don’t miss this once-in-a-lifetime opportunity to get an up close look at these majestic horses!